The Irish Wolfhound is one of the largest breeds of dogs. Their appearance actually belies their actual personality. To look at the breed running toward you, one might be a bit anxious at first. Once the Irish Wolfhound approaches you, it is a gentle sweet dog. It just looks intimidating. This breed used to hunt wolves in Ireland and they have the mouth structure to get the job done with long upper and lower canines. Being such a big dog, the Irish Wolfhound is not as active as other larger breeds. It is happy to lay around doing nothing but at least needs a large fenced in yard to move its big frame around. Although not popular today, the Irish Wolfhound does have a loyal following. Remember that large dogs cost much more to take care of than little dogs. They eat more. Medical costs for the breed are high because of the quantity of anesthetics and other pharmaceuticals needed to treat any medical condition. Remember that you should never ever let a breed of dog like this run after drinking or eating. This predisposes the dog to gastric torsion; also known as canine bloat. The coat of a Irish Wolfhound is wiry and relatively long so it has to be stripped or combed to allow the skin “to breathe”. This will help, along with an appropriate medicated shampoo, to prevent a lot of skin issues associated with most dogs. This is an issue with large, jumbo sized dogs. The skin is the largest organ of the body and there is plenty of it to go around in large breeds like the Irish Wolfhound! 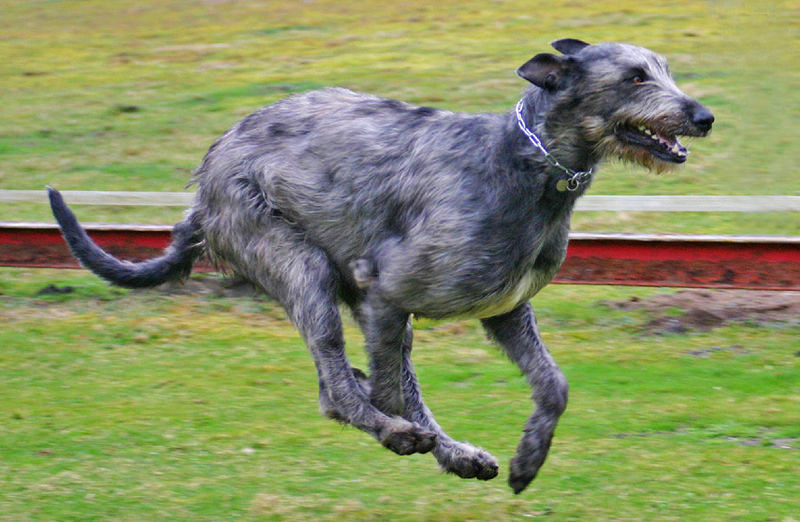 Although it has some maintenance issues, the Irish Wolfhound is a fine breed. It may also be used as a guard dog; due to the huge “intimidation factor” it possesses! Learn more about the Irish Wolfhound at Animal Planet’s® Dog Breed Selector.